The following good practice is conducted by members of College of Humanity and Development (COHD) at China Agricultural University (CAU): professor Yonggong Liu, PhD student Yang Gao, and master’s student Liu Zou. It is proven by many researchers, that in a traditional agricultural production system, lack of market access for selling local fresh fruit and vegetable products has been a fundamental problem faced by small farmers in the ethnic and remote mountainous areas. Lack of market access has been therefore seen as an important constraint to be broken through in the poverty reduction projects. In the past three decades, individual small farmers in China’s remote mountainous and ethnic minority areas have been always facing the marketing problem. Building a traditional market system with retail and wholesale and logistic delivery system is on one side a high financial challenge for the government, one the other side small farmers are marginalized in a traditional value chain. The situation has been changed in China in the past 10 years. The quick development of ICT and Internet as well as the fast improvement of rural transportation in rural China provided an unique opportunity for the development of rural e-commerce. In 2014, agricultural e-commerce was initiated by large internet enterprises like Alibaba and Jindong. Afterwards it is very fast developed under support of the government. In November 2015, the State Council of China enacted an official document “Policy Guidelines for Promoting Rural E-Commerce Development”, in 2016 Ministry of Commerce, Ministry of Agriculture, National Development and Reform Commission (NDRC), Ministry of Industry and Informatics have jointly enacted official document “Internet + for Modern Agriculture Action Plan”. In the same year, National Internet Development Office, NDRC and Leading Group Office for Poverty Reduction jointly released the Document “Internet Poverty Reduction Action Plan”. 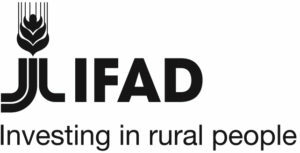 In the past 5 years, through governmental supports and active participation of stakeholders in the e-commerce value chain, a national-wide rural e-commerce system has been established and starting its irreplaceable functions in improving small farmers market access. The following case presents a successful model of rural e-commerce in Panzhihua City of Sichuan Province in Southwest China. Panzhihua Municipality is located in the most-southern point of Sichuan Province with a latitude from N 26°05′ to N 27°21′ and an altitude varying from 937 to 4395 meters above sea level. The total territory area of the municipality is 7440 square km. The annual average temperature is 20.3 C°. The municipal population in 2017 is 1.23 million, of which 26,000 rural poor. In the total population, there is about 16% ethnic people, such as Yi, Miao, Lisu and Naxi. Out of all mango growing areas in world, Panzhihua is a municipality in Sichuan province with the highest altitude, the northernmost latitude, and requires the longest time for mango maturity making it one of the most suitable areas in the world to produce mangos. By the first half of 2017, Panzhihua’s mango production and production value reached 200,000 tons and 2.1 billion yuan respectively. 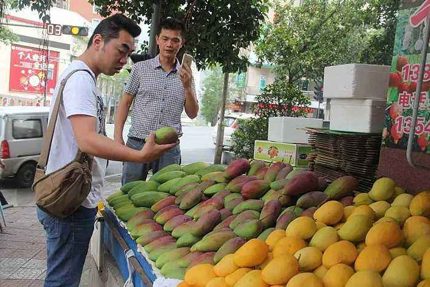 Nowadays, Panzhihua mangos are sold to more than ten countries and regions all over the world. For the local area, the mango industry has become an agricultural pillar industry for increasing the cash income of local farmers. Fig. 1 Stakeholders and their roles in Mango E-commerce Value Chain in Panzhihua Municipality. Farmers-Consumers model. In this direct marketing model, by using the e-commerce system small farmer are the producers and at the same time also the direct seller of agricultural products. Comparing with the traditional market system they naturally become the leading traders in the entire value chain. 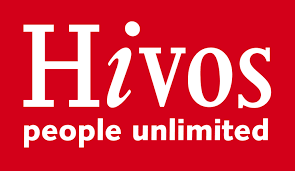 The Model of farmers + Cooperatives/Agricultural E-commerce Companies + Consumers. 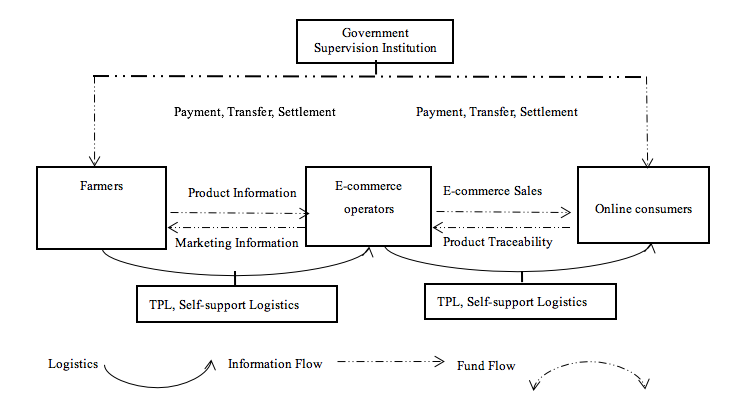 This is an e-commerce value chain operational model that is currently being promoted by the Panzhihua government. This multi-stakeholder model is led by a large-scale agriculture e-commerce companies in association with professional mango cooperatives. Finally, an e-commerce platform or a self-built platform is important to achieve orderly transacting connection between producers and sales. Model of Farmers-Individual E-commerce Operators + Second Marketing Agent + Consumers. This is the most popular mango e-commerce marketing model in Panzhihua. 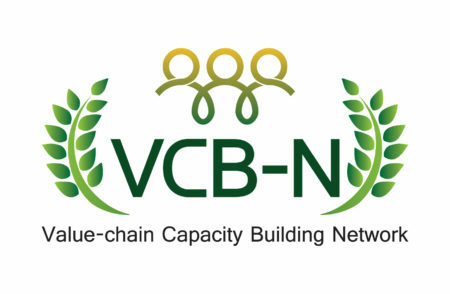 In this multi-stakeholder involved e-commerce model, individual e-commerce operating farmers are the most powerful leading stakeholders in the entire value chain. They are playing double roles in the value chain, namely the mango producers/providers and the sellers. 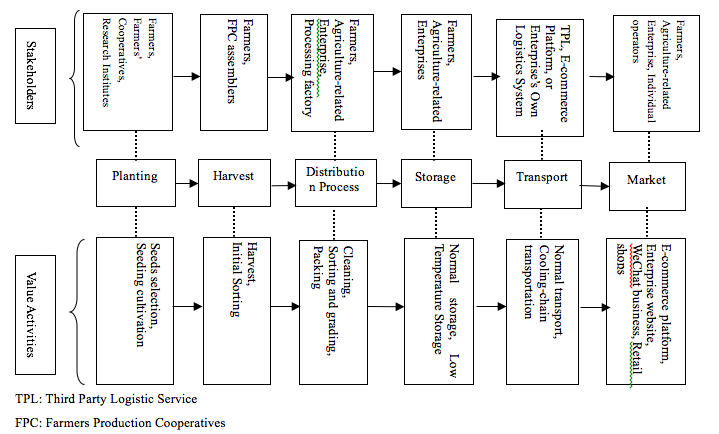 It can be seen from Figure 2 below that famers are the suppliers of the original products in the agricultural products e-commerce value chain. Mango growers in Panzhihua are mostly middle-aged male farmers with low education level, and their cultivated land is relatively small and scattered in different parcels. Most of famers due to the lack of knowledge about e-commerce marketing and shortage of governmental subsidies, as well as lack of on-farm logistics facilities, as a result, most farmers themselves did not involve in e-commerce marketing. E-commerce operators are the core actors in operating the whole value chain. The operators of mango e-commerce in Panzhihua are mostly highly educated young people. They mainly adopted B2C and C2C e-commerce models. Interestingly, the new model of Webcast can greatly help the operators expanding their market, and optimize B2B and C2C models. At the moment, too much investment in cold chain logistics, and lack of educated e-commerce operators are the most constraining problems for the agricultural products e-commerce based value chain development in Panzhihua. The consumer’s survey results revealed that online byers as consumers are playing roles of pushing the update and optimization of agricultural e-commerce value chain. How to ensure the marginal profits of all stakeholders related to the agricultural industry market and value chain, particularly to guarantee the minimum profit of small and individual farmers still remained as an issue for the government. 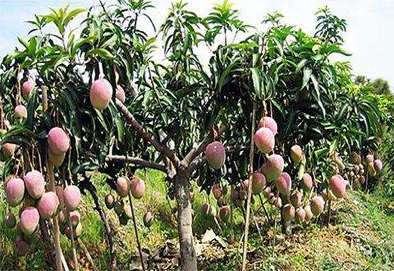 The research on the case of mango industry e-commerce system in Panzhihua revealed that the agricultural enterprises is the dominating stakeholder in e-commerce based agricultural value chain. For sustainable development of e-commerce based value chain system, agricultural enterprises and cooperatives should have a symbiotic relationship, i.e. to be ready to leave the minimum profit for individual producers. This kind of symbiotic relationship determines the long term healthy development of e-commerce value chain so that the enterprise can also enhance their market competitiveness in a long run. In addition, enterprises and cooperatives should also provide production funds, standardized environmental friendly production technologies and inputs, on-farm technical services. Farmers should produce high-quality, green, and safe agricultural products as required by the consumers. In a short word, they should build a mutual trust and mutual interest relationship. Lastly, but most importantly, the government should formulate and implement an effective policy to promote the win-win model while e-commerce value chain system development.